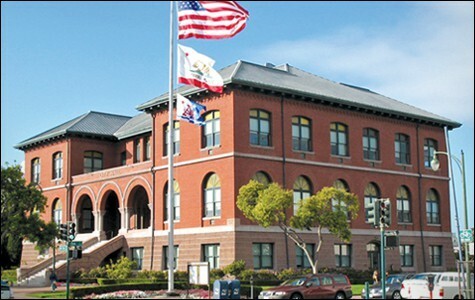 After eight hours of public testimony and deliberation, the Alameda City Council on Wednesday morning voted to extend the city’s current moratorium on rent increases and evictions for another sixty days. The council, however, did not approve any of the three rent control ordinances that were proposed, and told staffers instead to create compromise legislation during a meeting that did not end until after 4 a.m.
Tuesday night’s debate underscored the growing anxiety for renters who have facaed exorbitant rent increases and mass evictions by landlords during the past year. At a raucous November 4 council meeting concerning soaring rents, two residents were arrested at City Hall and one was bloodied by police. Tuesday night’s meeting was not as intense. To accommodate a large crowd, the city held the meeting in the cavernous Kofman Auditorium. But the council was unable to agree on any of three rent ordinances proposed by city staffers. The proposals included a landlord-friendly plan to strengthen the city Rent Review Advisory Committee (RRAC); an ordinance somewhat favorable to renters that included binding arbitration for settling rent disputes and some restrictions on no-cause evictions; and a third, compromise solution. Following a recess at 12:40 a.m., councilmembers discussed the proposals until 3:55 a.m., and then directed city staffers to bring back a rent ordinance in mid February that includes the following: Adding binding arbitration to settle rent disputes at the RRAC; requiring landlords to petition the RRAC for any rent increases of more than 5 percent; requiring landlords to offer one-year leases to tenants during their first year; relocation fees based on the length of tenancy, in addition, to $1,500 for moving expenses; and a yet-to-be determined cap on evictions. Talk of restrictions on rents and evictions in Alameda has gained the attention of large-scale property owners and the statewide California Apartment Association. Greg McConnell, a well-known Oakland consultant who was representing Alameda landlords on Tuesday night, urged the council to avoid options rent control. “A lot of people have suggested that you need to follow Oakland as though they work,” McConnell said of Oakland’s rent control laws. Such restrictions are also expensive, said McConnell. “Be prepared for a significant cost of payment,” he warned. Later, a representative from the California Apartment Association labeled rent control as a “tax-free subsidy” for renters.